"There are a lot of people out there who love singing, but they don't get the chance to do it. 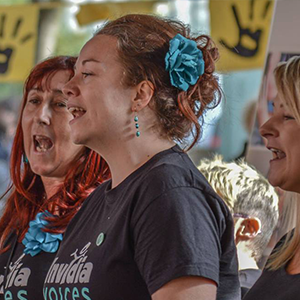 Invidia Voices is a Rock and Soul Choir that gives them the opportunity to sing and perform as much as they like in a supportive environment. They love the singing - but they actually get so much more!" I want to join Invidia Voices! Sign me up! 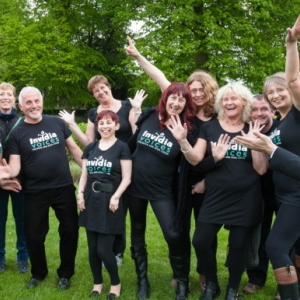 Welcome to Invidia Voices, a rock, pop and soul choir based in Norwich and across Norfolk. If you're looking for a fun and supportive environment in which to sing the songs you love, come along to Invidia and join in. We're a mixed ability choir, with no auditions to join and no pressure to sing solo. Our members just have one thing in common - they all love to sing! Which means you don't have to wonder if you will be "good enough." If you love singing you qualify to join! Which means you will be able to join in from the start just by following the lyrics! However, sheet music is available if you prefer! Great for husbands and wives who share a love for singing, as well as parents who want to spend more time with their sons or daughters, or even the whole family! We will offer you not just one but two taster sessions COMPLETELY FREE. If you love it, great! If you don't there will be no obligation and no charge. What have you got to lose? 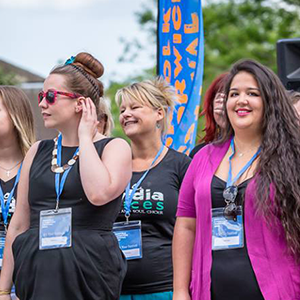 With Invidia Choir groups in Norwich and across Norfolk, each group meets once a week in five - seven week terms to learn fun, exciting harmonies and sing our hearts out. Our playlist includes songs by artists such as Queen, The Jacksons, Aretha Franklin, Adele, Stevie Wonder, Evenessence, Bon Jovi and many more. Invidia Voices has 8 rehearsal groups, with more starting soon. So, if you love singing and fancy giving it a go, get in touch now and book your first free taster session with us.